When you harvest your weed, the buds still have all sorts of nastiness in them. Stuff like nutrients and sugars. If you grow organic, in theory, none of this should actually be bad for you, as far as I know. But, it tastes nasty. You definitely want to get rid of this stuff. The “classic” way of curing is dry your bud very slowly. If you keep it in a cool, dark, humid place, the plant will continue to digest the sugars and nutrients. As well, some sugars with break down over time. Give it a week or two and it’ll gobble up most of what’s left, leaving you with good tasting weed. The classic curing method has a number of downsides, including a propensity towards mold. Methods like jar curing and bag curing are tweaks on classic curing, aiming to reduce the risk of mold and increase the amount of nutrients and sugars digested. Water curing is a totally different method. Instead of relying on the plant to digest the remaining nutes, you use water to dissolve them. If take some weed and soak it in a bunch of water. Nutrients are basically salts, and sugars are sugar. Sugar and salt dissolve well in water. THC and the resin glands don’t dissolve in water. Water works faster than digestion, so water curing is a great way to cure in a rush. Normally, you water cure in sealed jars. Take a glass jar, like the kind you use for jar curing. 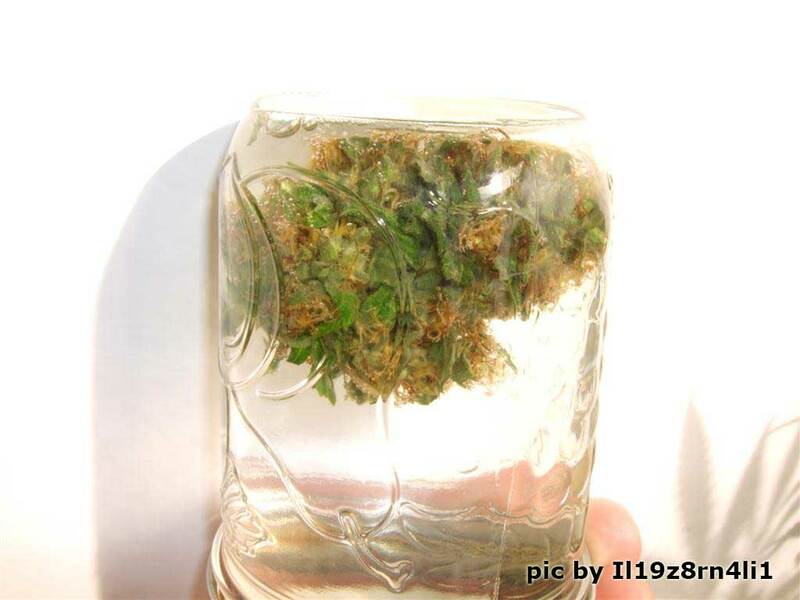 Fill it with water and bud then close it tight. Change the water once a day for 3-5 days then strain out the water. Dry in a typical fashion (being extra careful about mold, since any lingering water droplets can increase the chance of contamination). That’s it! It takes 5 to 8 days, which is a lot better than the 10 to 18 days normal curing takes. This method leaves your bud with very little taste or smell. It tastes flat, not even grassy. The smoke has very little smell and is not discernibly marijuana. And, it’s smoootthhhh. Like Belvedere vodka…little flavor so you can have some at lunch and no one will notice. I have a tweak to this method. Instead of soaking it a sealed jar, I suggested using running water. My idea is that a continuous stream of water will cure faster. It works on the same principal as defrosting food, convection ovens, and even airflow in a grow room. Think of it this way; when you change the water at the end of the day, that water is pretty saturated. Saturated water doesn’t absorb new minerals as well as clean water does. When you have a convection current, you’re guaranteeing clean water all the time. This is why you want a running fan in your grow room, instead of just airing it out once a day. To do this method, I filled a large bowl with bud and ran water over it. I used a very thin stream, so it was a small trickle of water coming in. The water was cool, but not cold. You want it cold enough that it doesn’t wilt the leaves, but not so cold that it makes the trichomes brittle. And you need just the smallest trickle of water. Too fast and you’ll agitate the trichomes and some will fall off. 8 hours is all it needs, maybe 10 if your buds are very dense or large. When do I harvest my buds?